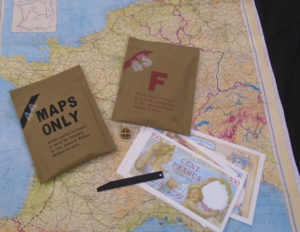 On eBay I’m seeing copies of escape map pouches that are really well done, at least for re-enactment. There were different versions, but currently I see only one kind. You can also get the French banknotes, escape saw blade and escape compass to go with it. This is the link to the seller’s page if you’re interested. As long as these items are being sold as replicas, it’s quite harmless, and as such they are great for living history displays and re-enactment. But sooner or later these items will be ‘aged’ and passed off as originals, or ‘not sure how old this is’ etc. Years ago, I added this magazine cover in the article about this subject. 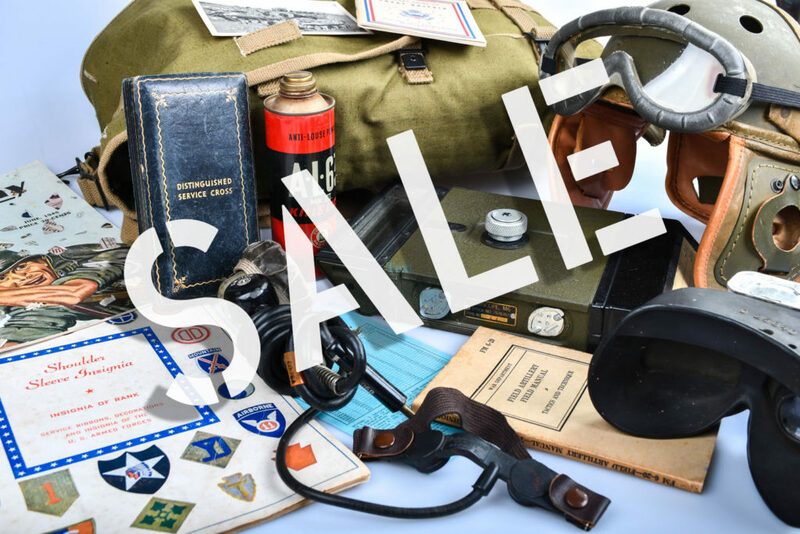 With a story about the 503rd PIR in training, this is one of the best period magazines on this topic for collectors. 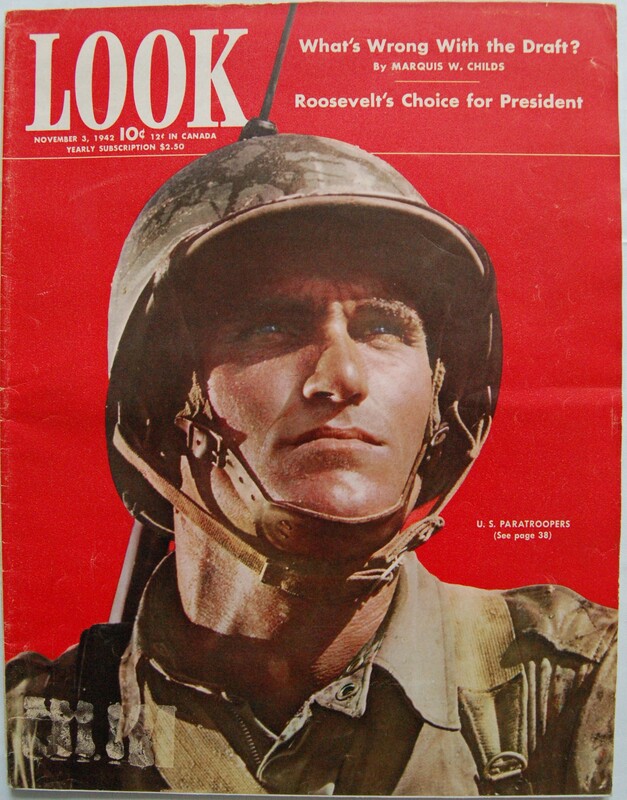 Some readers had already come forward stating they know the paratrooper on the cover as PFC Robert Green. Apparently this is documented in the January 12, 1943 Edition of Look Magazine on page 62 where Mr. & Mrs. L.H. Green of Stephens, Ark sent in a picture and a thank you to the magazine which states “The Paratrooper on your Nov 3, 1942 Cover is our son, PFC Robert L. Green. Thank You for giving him this honor!”. Thank you Kenneth Peck for sharing this! 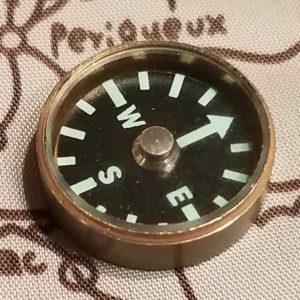 I came across this US model escape compass being offered on eBay as a reproduction. It looks like it’s really well made, so beware of these coming up for sale by other sellers later. The may be ‘mistaken’ for originals. The seller even uses a photo from my website to compare his creation with an original, but he kindly agreed to quote me as the source. David White kindly sent me a photo of a USALite brand TL-122-A, new in the original box. Absolutely stunning, and it gives as a good idea of the original paint finish. 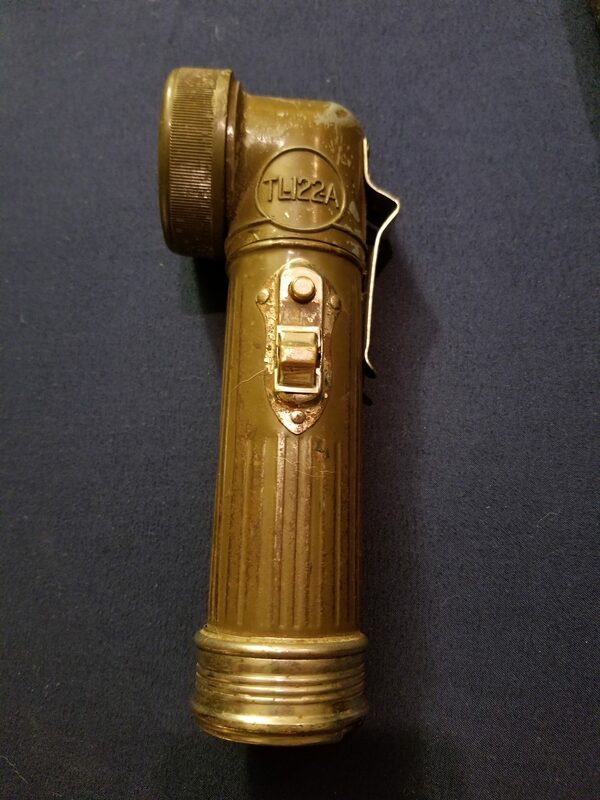 The box may be commercial, but the flashlight would have looked the same. 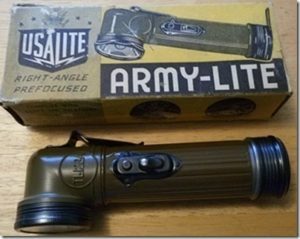 Note that the lens cover on the box is angular, whereas the actual flashlight has a round lens cover. I recently picked up this badge that I had been searching for a long time. This silver device features a snarling hyena surmounting a crescent that bears the motto “J’y Suis, J’y Reste” “Here I am, Here I Remain”. 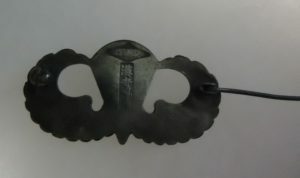 The reverse has removable clasp over 2 rings (like for beret attachment) and is inscribed in raised relief with DRAGO, PARIS, H 131. The US paratroopers of the 509th PIR are allowed to wear this badge (usually on the right pocket) because on November 15th 1942 the 509th (then 2nd Btn 504th PIR) parachuted into Algeria to take control of the Youks Les bains airfield. The airfield was 200 miles from any US reinforcements and was defended by the French 3rd Zouaves Regiment which where dug in. 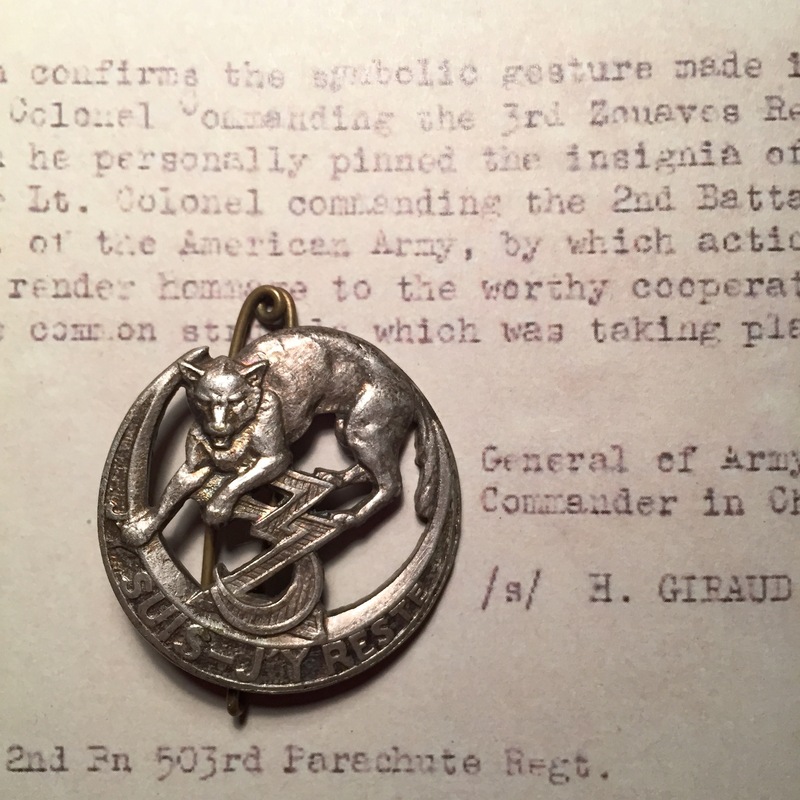 No weapons where fired as the French commander walked forward and pinned his regiment badge onto the tunic of Lt. Colonel Edson Raff declaring themselves comrades. This badge was the first foreign award that was allowed to be worn by US troops in WWII. In the book “First Airborne Taskforce”, there are many photos of paratroopers wearing this badge during the invasion of Southern France. 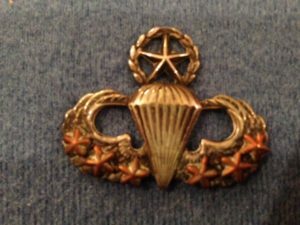 As far as I can tell, my badge is a WWII-period badge, but if anyone has more information about it, I would love to learn more about it. 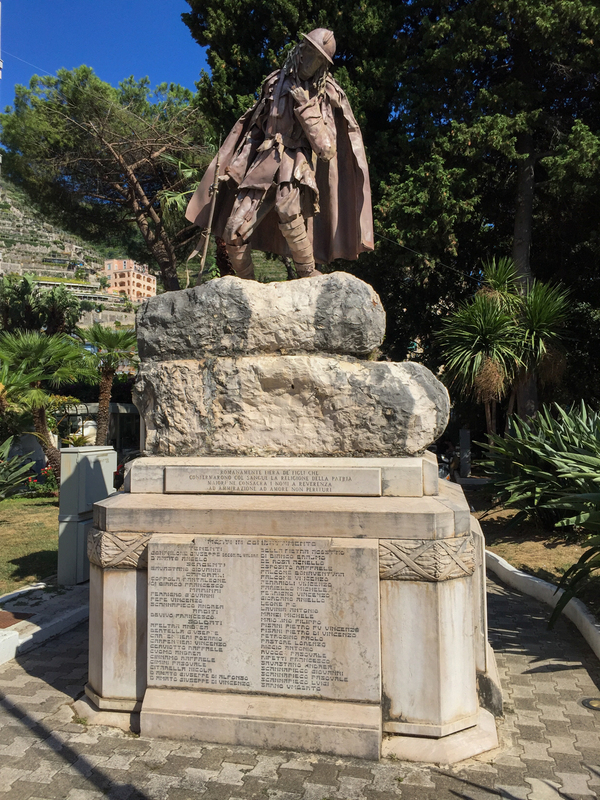 When on vacation at the Amalfi coast and Salerno-Napels region this summer, I visited some interesting WWII sites that I would like to share with you. I’m starting with the smallest one first: a monument to the contribution of the US Rangers during operation Avalanche – better known as the Salerno landings, executed on 9 September 1943 as part of the Allied invasion of Italy. The Italians withdrew from the war the day before the invasion, but the Allies landed in an area defended by German troops. Things went South quickly that day when the 5th Army landed on a very broad 35-mile front, with the attacking Corps spread far apart and with a terrain highly favorable to the defender. 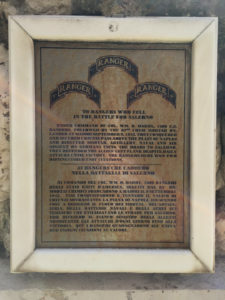 A Ranger force under Colonel William O. Darby consisting of three US Ranger battalions and two British Commando units was tasked with holding the mountain passes leading to Naples, but no plan existed for linking the Ranger force up with X Corps’ follow-up units. Finally, although tactical surprise was unlikely, Clark ordered no naval preparatory bombardment take place, despite experience in the Pacific Theatre demonstrating it was absolutely necessary. 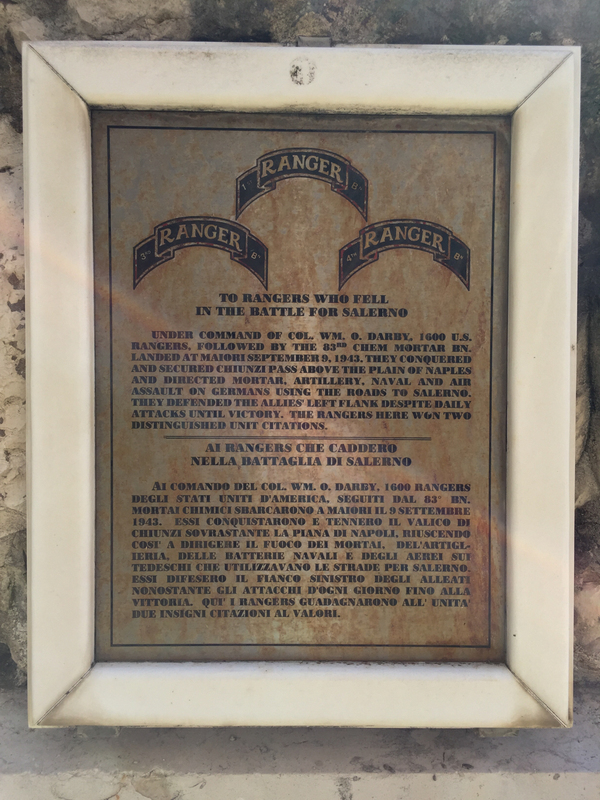 The Rangers landed at Maiori and the Italian WWII monument on the seaside boulevard bears a plaque to their memory. Other than that, there’s nothing left to remind us of the presence of Americans in WWII. Jeff Ruch sent me photos of this peculiar variation of the TL-122-A. It looks like it has been assembled from parts of different types of TL-122 flashlights. From the chrome plated switch, I would guess it was refurbished for the civilian market. As for the battery cover, I think the black paint has worn off. It came off easily and TL-122-As with the original black paint on them are rare. Apart from the color, it looks just like the cover in one of the photos in my article. Interestingly, the parts of this mix and match flashlight do fit together, and it actually still works.